...... You can do speedy recording by hot keys or signal detection, or scheduled recordings by timer. Audio Grabber gets music from audio CDs to 6 major audio formats: AAC, MP3, MP4, WMA, OGG and WAV. It has clean, rich,CD audio quality results, nice-looking interface, full CD audio playback control function and very fast encoding. You can choose between various bit rate, sample rate and channel settings for every grabbed file. Convert your music between 6 major audio formats: AAC, MP3, MP4, WMA, OGG and WAV through Audio Format Converter. Converter has clean, rich,CD audio quality results, very fast encoding. AAC format,supported by this utility is used by major products like iPod and iTunes. 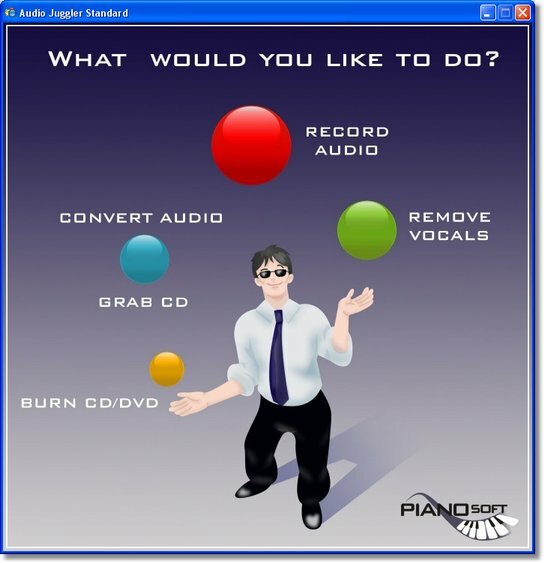 You can even reduce vocal part from music and prepare it for karaoke fun through vocal remover module. Vocal remover supports every important audio format as input and 6 output, exporting formats. contains a array of CD/DVD creation, duplication, and extraction technologies. Qweas is providing links to Audio Juggler 2.2 as a courtesy, and makes no representations regarding Audio Juggler or any other applications or any information related thereto. Any questions, complaints or claims regarding this application Audio Juggler 2.2 must be directed to the appropriate software vendor. You may click the publisher link of Audio Juggler on the top of this page to get more details about the vendor.